You can add information into a Description section but I don't think that's what you want is it? Unfortunately there is no way to add keywords etc, it is purely a view and comment option for now. 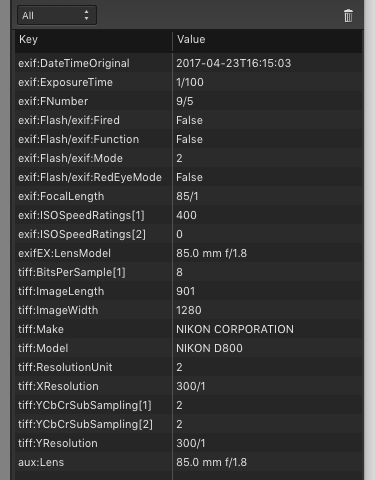 Personally I think it would be a definite asset to have EXIF editing in Affinity but at the moment it's not possible. 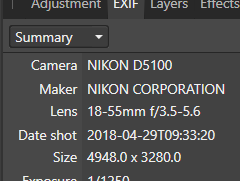 You will have to look for a 3rd party app for EXIF editing what OS are you on? I'm sure there are more and favourites that people here use. 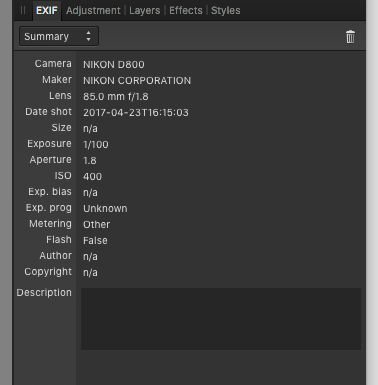 Adobe Bridge is now free and has some good Exif handling, including adding metadata to many files at once, plus creating and applying metadata templates. Ironically APh uses and comes along with Exiftool, but they don't make full use out of it's capabilities (like adding XMP keywords, custom user-defined tags etc.). I recall them saying that they're looking into replacing ExifTool in the future. Therefore I get the impression it was possibly only a temporary solution until they had more time to work on developing their DAM software. As it is they're stuck with a 32-bit unsigned executable, and although I use ExifTool myself to bulk edit incorrect 'Date Taken' fields, I know some AV programs don't like it as they will keep scanning it before allowing it to run due to it not being signed. If I remember correctly there was something odd about it that meant it couldn't be signed because the signing process writes to the end of the executable, which is where ExifTool stores it's own resources. @Sima for sure since it's initially a Perl based solution and on Windows systems the ActivePerl related stand alone executable is pl lib dependent and always needs to be forked as a process in order to be run. Also since Exiftool is not available in a C/C++ exif library integrateable manner, in contrast to libs like the Exiv2 C++ library or libexif C library, they might want to go that way instead. @firstdefence just seeing an incomplete not shown up [5a] above instead of some GIF image. Yo, yeah I was swapping the gif out for an mp4 and the dinner bell went so everything else lost focus as I ran downstairs and into the kitchen with fork in-hand lol! I know that I am pretty late for this discussion, but I also was looking for a way to add keywords to my finished images. I just purchased APh a few weeks ago and I am still learning how to use it. It took me 3 years to perfect my techniques with Photoshop CS5, but when I upgraded my Mac from Lion OS to High Sierra the old PSCS5 no longer worked. That was when I found APh. 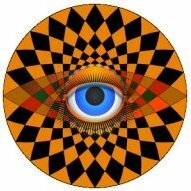 Aph seems to have a lot of CS5's tools, although the way they are controlled is a little different. I will eventually learn them like I did with CS5. However, since I make my living as a photographic artist I upload my artwork to many stock photo sites for sale and they require good metadata. In CS5 there was an XMP panel where I could add the title description and keywords, but just as was mentioned in your discussions, it seems that only a description can be entered using APh. I have found that I can use my Mac's "Get Info" tool to add keywords, which in Mac are simply called Tags. But not all of the stock sites I upload to recognize those Mac based tags, which forces me to re-enter them manually at the upload site. I think it would be a good idea to add some kind of XMP or EXIF ability for adding keywords in a program update in the future. 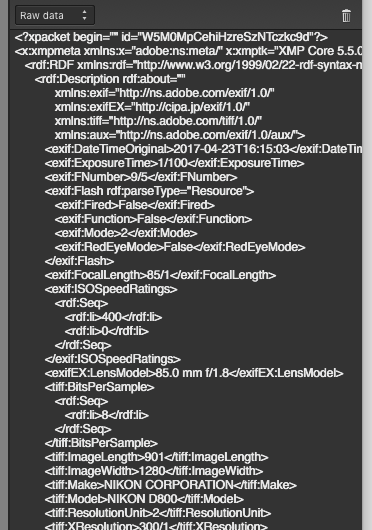 When I studied the contents of my old CS5 program folders there was an XMP plugin. Perhaps there is a way to add this ability to APh as some kind of Plugin. All I want to see are the dimensions. I have seen on videos that if you click the camera icon on the right it will show all kids of metadata. I have seen just the dimensions but can’t seem to find the setting myself. I'm not sure what "camera icon on the right" you're referring to.